The past few months have been a bit of a whirlwind. I'll admit I'm struggling a bit getting my mojo back - balancing 2 kids and being back to work full time is a balancing act I haven't yet mastered. Some things fall to the bottom of the priority list but I still love a good party! 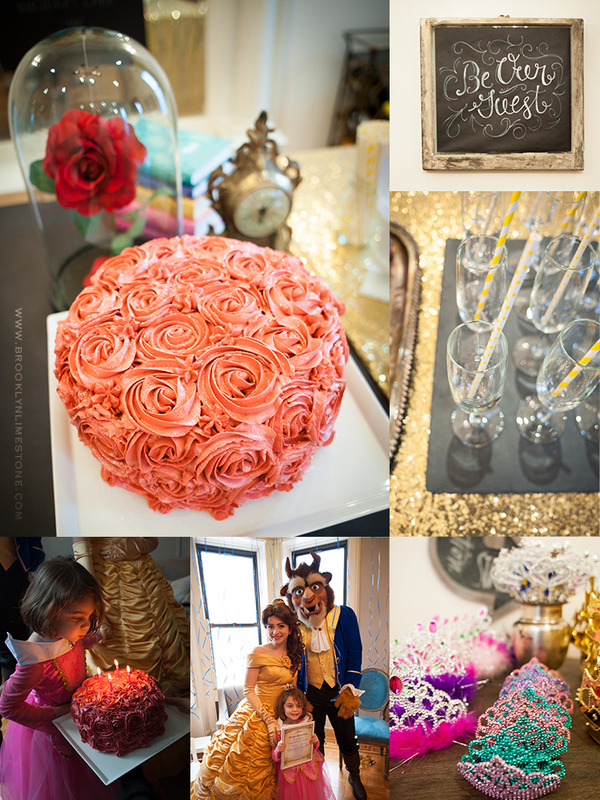 Aggie's fourth birthday was celebrated with a Beauty & The Beast theme and a house full of 4 year olds. I went pretty simple on the decor this time around - a rose in a cloche, an antique clock and a stack of books decorated the cake table. A small table with a selection of tiaras and crowns and septors made up a "Coronation Station". A simple DIY bellini bar that was much appreciated by the parents (non alcoholic "princess punch" was an option for the kids) and a grilled cheese station rounded out the menu. For entertainment, we went full on cheese and had Beauty & the Beast stop by to read stories and sing songs. It was an exhausting day but this age is so magical and she loved every minute. I'm glad we got to do it for her. Love that you found time to make another magical party happen for Aggie. Especially a princess birthday party - those ones aren't forgotten! She looks thrilled. I love the Beauty and the Beast party and she chose to wear her Princess Aurora costume. Adorable!! I loved when my girls were that age and I never knew which princess would come down the stairs each morning. i think your bellini bar link is taking us to the wrong post. maybe? was looking for a listing of ingredients you set out, etc. thanks so much! - garnish choices were cheerries, lychees or raspberries. I didn't photograph them but I also put out frozen peach slices to serve as ice. Those were big hits. I think that's it! Hope that helps.